Surveillance technologies infiltrating computer systems of human rights activists can result in their imprisonment or death. The EU needs to put greater emphasis on working with activists. 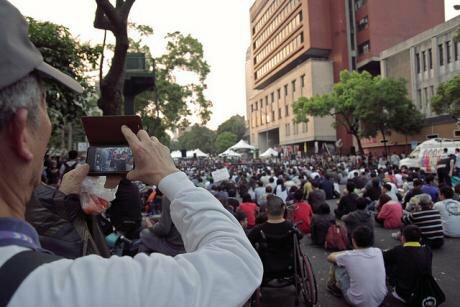 Elderly man uses his smartphone to video record the large crowd gathered on Jinan Road (濟南路), near the ROC Legislative Yuan (立法院) in Taipei (台北), 2014. Flickr/Tomscy2000. Some rights reserved. New technologies are creating both opportunity and danger for human rights activists. Social media platforms, anonymization and encryptions tools, and widespread internet access are empowering activists to exchange ideas, document abuses, and disseminate information to wider audiences. On the flip side, governments are using surveillance technologies to target, prosecute, and silence activists. The European Union should breathe new life into its support of activists to help overcome the negative side effects of new technologies. The current EU strategy is focused on preventing surveillance technologies getting into abusive hands. On February 28, 2017, the European Parliament discussed a proposal for updated restrictions on dual-use exports (including surveillance technologies) that was drafted by the European Commission last year. The proposal recognizes that surveillance technologies are being used to “infiltrate computer systems of dissidents and human rights activists, at times resulting in their imprisonment or even death.” There will be a hearing on dual-use exports in the Parliament on March 21, 2017. Tighter regulations are welcome, but at best they can limit government access to surveillance technologies, as opposed to restricting access or changing government behavior. After all, other states will continue to export surveillance technology unabated. The United Kingdom’s departure from the EU will further reduce the impact of export restrictions. In 2015, the UK exported phone monitoring technology to Israel, Bangladesh, Egypt, Saudi Arabia, Turkmenistan, and the United Arab Emirates. ‘Brexit’ is likely to increase British technology exports to repressive governments. Theresa May, the UK Prime Minister, has already placed trade deals above human rights concerns amidst growing partnerships with Gulf Monarchies. The United Kingdom’s departure from the EU will further reduce the impact of export restrictions. Israel, another large exporter of surveillance technologies, made up 10 percent of the global cybersecurity market in 2014 and has exported surveillance technology to Uzbekistan, Kazakhstan, and Uganda. China also has extensive surveillance capabilities and is considered one of the worst abusers of internet freedom. Accurate data on the extent of Chinese exports of surveillance technologies is unavailable, but reports indicate that China has exported surveillance technologies to Iran and Algeria. European export controls are clearly not enough to have a lasting impact if other countries are able to freely export surveillance technology. DigitalEurope, a lobby organization, has argued that European export controls are pointless if other countries can act as they wish. For this reason, there is a need to protect activists from the surveillance technologies that get into the hands of abusive governments, but also to recognize the limits of such protection. Nongovernmental organizations have led the way in developing new technologies and guidelines on best practice. InformaCam is a smartphone app that records the date, time and location of imagery, as well as encrypting it, to make sure it cannot be tampered with. Amnesty International created the Panic Button, which turns a smartphone into an alert system. Security in a Box and the Electronic Frontier Foundation have provided guidelines on how to protect activists from surveillance technologies, such as information on how to bypass censorship and safeguard yourself from malware. In addition, the United States is playing an important role by funding independent websites in closed societies, providing training in online security, and developing secure communications for smartphones. The protection of activists, however, is a reactive response to surveillance technologies. Further, the effectiveness of using technology to protect activists is under question. As governments are often the gatekeepers of technology and have access to greater resources, they have the power to draft legislation banning a certain technology if it becomes unfavorable, or legally request information from service providers, among other measures. The effectiveness of using technology to protect activists is under question. Beyond acting on the defensive – limiting exports of surveillance technologies and protecting activists from human rights violators – the EU should adopt a more proactive human rights policy that takes advantage of technological change. The EU Action Plan on Human Rights and Democracy (2015-2019), a strategy document that guides the promotion of human rights and democracy for EU institutions and member states, lists improving the capacity of local actors as its first objective. The plan, however, pays little attention to technology and fails to harness its positive potential. EU policy has largely focused on the way technology is restricting, not aiding, human rights activism. To remain relevant in the human rights struggles of today, the EU should expand its tactic by seeking to enhance digital literacy among activists in order for technology to be used in an effective way, especially for those working in closed or closing political spaces. Technology changes the paradigm by allowing victims to become agents in the documentation process. 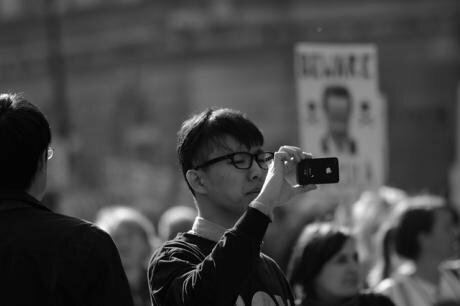 First, widespread use of smartphones and other recording technologies can lead to broad-based participation in activism through opening up the process of documenting human rights abuses to ordinary citizens. This will shift the power balance away from elite domestic and international organizations to build a more inclusive form of activism. Traditionally, victims of human rights abuses have been the subject of fact-finding missions, but technology changes the paradigm by allowing victims to become agents in the documentation process. Although technology is often unevenly shared throughout society, it can be used to enhance the participation and empowerment of women, children, people with disabilities, the LGBTI community, and minority groups. By taking part in such processes, victims can become aware of and take ownership of human rights. The EU should encourage the participatory documentation of human rights abuses to facilitate activism throughout society. Second, technology can transform human rights activism through increased access to data. More data is available than ever before, as every individual has the potential to become a source of information. Whether it is the thousands of images taken on smartphones throughout the occupation of Tahrir Square in Cairo, or the use of geospatial technology to document human rights abuses in Darfur, technology can provide human rights activists and policy makers with unparalleled levels of data. The EU should encourage its NGO partners to use new technologies like crowdsourcing and commons-based peer production to gather large quantities of data, which will be useful for understanding and highlighting the scope of a human rights problem. Third, technology can be used to verify the data. The widespread availability of data will become a problem if it cannot be verified accurately, as it has the potential to distort information. For example, a video circulated on YouTube of Colombian police officers spraying a water cannon towards a man tied to a tree was circulated to denounce police violence in Colombia, Mexico and Venezuela. To name and shame a government or mobilize public opinion, accurate data is vital. The YouTube Data Viewer allows videos to be turned into thumbnails that are then processed in Google reverse image search to see if the thumbnails have previously appeared on the web. The EU should fund the verification of the large quantity of human rights data becoming available through such means. Fourth, there is a need for the EU, human rights activists, and innovative technology organizations to work together, as technology will to continue to develop and transform human rights activism. Witness, Benetech Tactical Tech, Digital Defenders Project, Engine Room, and Access Now are just a few of the organizations bridging the gap between technology and human rights that the EU should partner with. Ultimately, human rights activists must have the final say in whether or not they engage with new technologies. The risks are high, but so are the rewards. The European Parliament should demand tighter EU export controls and request that the European Commission support activists in taking informed decisions on risks and safety. But on top of this defensive approach, the EU needs to put greater emphasis on working with activists in order to reap the full benefits of technology. Flickr/Tim Brockley. Some rights reserved.